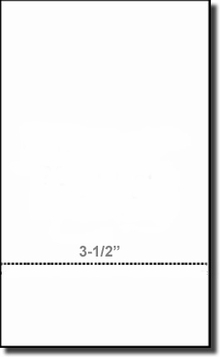 This is high quality White Bond Legal Size Laser--Inkjet perforated paper, 8-1/2" x 14", with a full Laser Perforation at 3-1/2" from the bottom of the page. There are 500 heavy weight (24#) sheets to a Package (1 ream) and 5 Reams (2,500 Sheets) to a case. Common uses include Church Bulletins, Receipts, Inventory tags, Shelf labels, or any other item where you can print and produce a return document on a single sheet of legal size paper. This paper arrived exactly as expected and to the specifications posted online. Works perfectly for our purposes. We use this paper for our weekly church bulletins. Good weight. Feels like higher quality paper. Images print well on it. 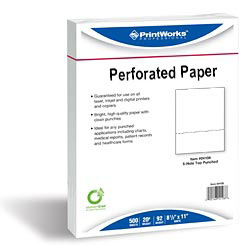 The perforation is easy to fold and tears clean. We've been using this paper for 6 months or longer and will continue to order.